The church bells rang in Bottesford on Surrender Day (VE Day), immediately after Winston Churchill’s proclamation. Bottesford bell ringers rang an opening peal of 360 changes of Grandsire Double and further ringing included “firing a victory salute”. Every seat was occupied in church for a thanksgiving service on the Tuesday evening when the Rector gave a short address. Mr W. Carter, church organist, was home on leave and accompanied the hymns. A retiring collection received £11.10s. for the Christian Reconstruction in Europe Fund. The following Sunday, morning and evening services of thanksgiving were held. There was a full congregation and the Rector officiated. Scouts and Guides attended the morning service and the collections for both services totalled £24. To celebrate VE Day, Bottesford School was closed on May 8th and 9th for the National Holiday. The pupils at Muston School assembled for a short service and then were given two days holiday. In the evening, Muston church was filled for a thanksgiving service and the collection received £3.4s for the Christian Reconstruction fund. The people of Bottesford celebrated the final victory in style with a sumptuous repast on the Rectory lawn, followed by music, dancing and games. Mrs Blackmore had arranged the celebration at short notice as Canon Blackmore was in London. Bottesford Scouts and Guides conducted a house-to-house collection within the parish. They collected an abundance of goods including provisions. Mr Hurn provided radiogram music, assisted by Mr Coogan. Sports and competitions were organised by Major Armstrong. At the conclusion of celebrating the joyous news, apples, cakes and lemonade were distributed to all the children. The Guides and Scouts hoisted a flag and constructed the huge bonfire that blazed on a neighbouring hill and ‘flickered merrily’ until a late hour. There was a good reason for the merry flicker! The Bottesford Scouts had built the bonfire on Beacon Hill. Some of the lads had been down to the Bottesford Gas Works and collected a 40-gallon drum of tar that they had then transported up the hill and concealed in the bonfire. The metal bung in the drum melted far more quickly than the metal drum. The tar expanded with the heat and a gush of flaming spray emerged from the centre of the bonfire and travelled for yards and yards. Health and Safety in 1945! Special services were held at church on Sunday that attracted large congregations including the Girl Guides led by Mrs Lane. Lt.Col. Fox of Petrol Depot Bottesford and his men attended morning service and Lt.Col. Fox read the lesson. RAF personnel from Bottesford Airfield joined the congregation in the evening. A Gala Day was held on the Cricket field, organised by the War Effort Coordination Committee. The event included a horticultural show, baby show, fancy dress, a dancing display, sideshows, stalls and a marionette show. The event raised £160 for the Services Comforts Fund. A ‘Victory Tea’ was held at the West End, organised by Mrs B Abbott and Mrs B Jallands. Colin Doubleday took photographs, Mr Baggaley organised the sports and winners received money prizes. Captain Wright (a prisoner of war for 5 years) spoke and gave each child a shilling. He then lit the bonfire and parents and children sang and danced. Mr Peter Topps remembers that bonfire and also the bonfire that was lit on the triangle of land by Muston Lane at Easthorpe. Mrs Joan Norris lived at Muston Gorse farm with her family and remembers that her parents put Union Jacks on all the washing posts to celebrate the end of the war. 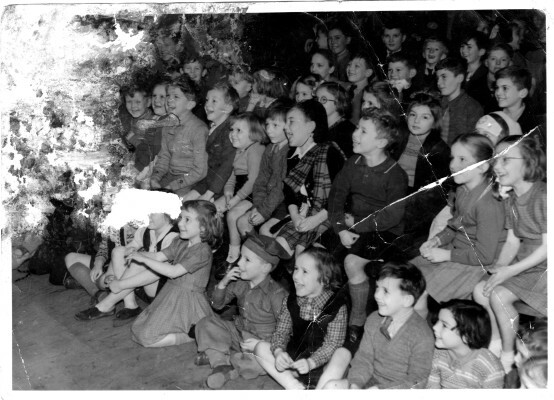 The Grantham Journal reported on September 14th 1945 that the children in Queen Street had attended a celebration party. Mr Ian Norris (from the High Street!) also remembers this occasion and that it was organised by Mrs PM Robinson, helped by Mesdames CJ Bend, CK Cooper, LJ Abbott, C Mumby, Miss Emily Bailey and Allison. 32 children sat down to tea in the Cooperative Hall and Mr Roy Matthews entertained them with a magic lantern show. At the end of the party, each child received 3d from Mr JD Robinson, the oldest inhabitant of the street. Children from the Grantham Road district celebrated VJ Day on the following Friday, at the Mill House by kind invitation of Mr and Mrs LJ Kirk. The ladies of the district provided tea and it was followed by games. At dusk, a large bonfire was lit in the paddock. On leaving each child received a 1s. Savings stamp and a 3d bit. Children resident in Church Street and Market Street were entertained to tea on the Monday following. Games were played and a singsong followed. At the end, each child received a monetary gift. This page was added on 07/05/2015.